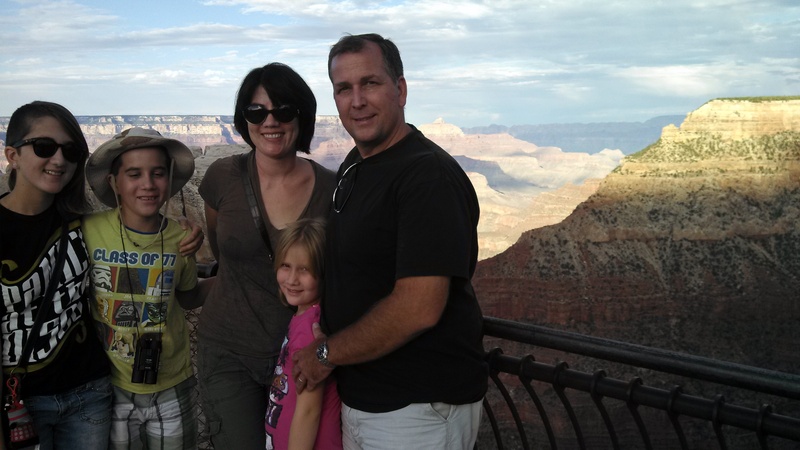 Last week, we got the harebrained notion to go to the Grand Canyon. 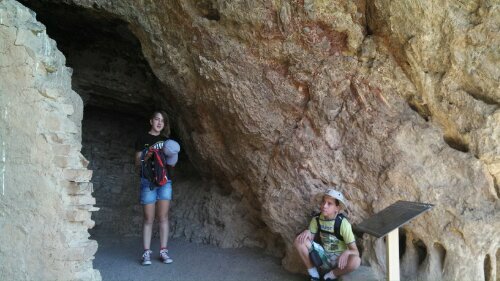 We also decided to go to Tonto National Monument to see a cliff dwelling, and the Tonto State Park Natural Bridge. We filled a cooler with ice and water bottles and took off. 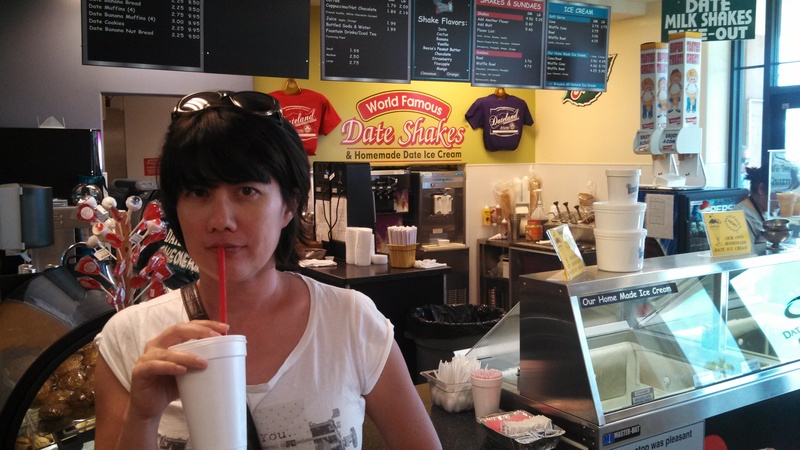 In Date City, or Date Town, or Date Village (Date something), I made us stop for a Date Shake. This is 100% the fault of Janice Steinberg’s The Tin Horse, a book I blurbed some months ago. In it, the character stops in the desert for a Date Shake and I’ve been wanting one ever since! It tastes like dates and vanilla ice cream. There are pieces of dates in it, so if you don’t like dates it is not the shake for you. I liked it. Eldest didn’t like it at first, but then decided it was pretty good and it grew on her. The other kids wanted nothing to do with it. 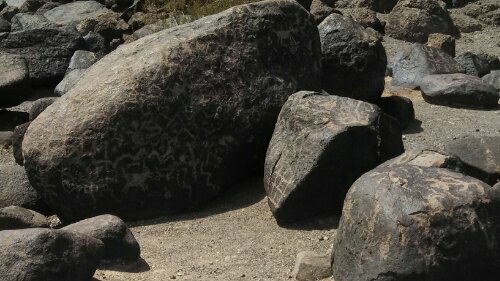 Then, more out in the middle of nowhere, we saw the Painted Rock Petroglyph Site, outside Phoenix. 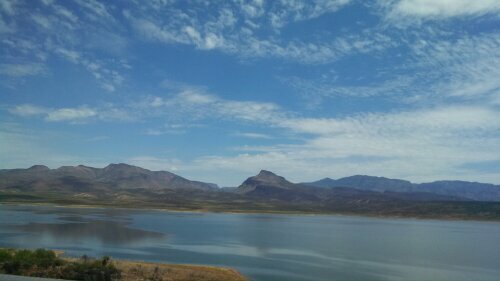 It is about 10 miles off the 8 and it was like 109 degrees. Little Girl’s face instantly turned red and she said she couldn’t take it. 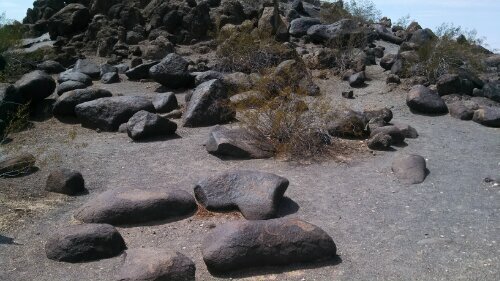 You walk around a big pile of rocks that were painted 12,000 years ago. I don’t know why it’s a campsite or why its busiest time is April through October. It’s HOT. 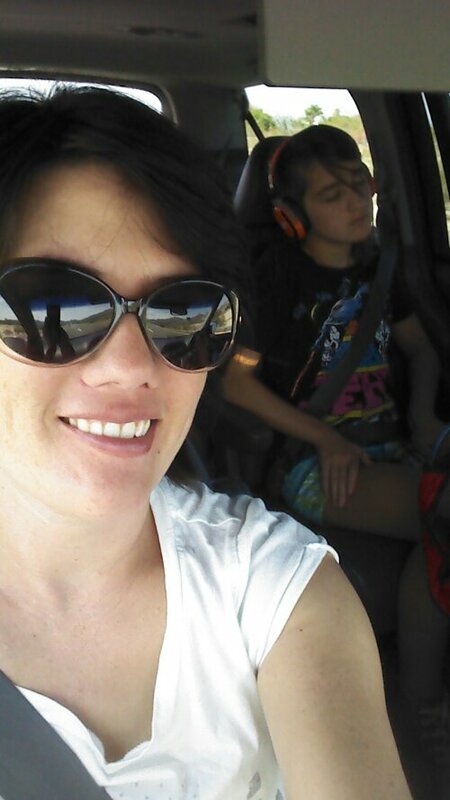 Those were pretty cool, though I had to take the girls back to the car because they were turning into ash. This place cost $2. On honor. 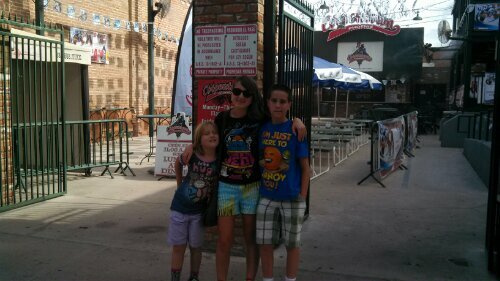 Then we went to Phoenix and since it was near dinnertime decided to stop at Cooperstown. What is Cooperstown? 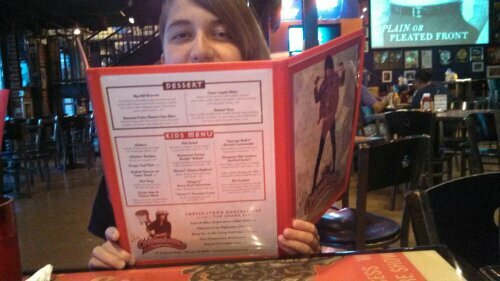 It is Alice Cooper‘s restaurant right by the ballpark. It’s a sports bar, basically. Their claim to fame is the 22 inch “Big Unit” hot dog, which of course we had to get because it was supposed to be really good. 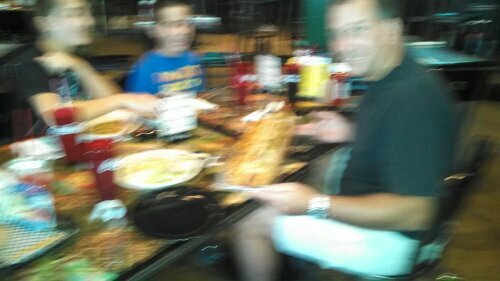 Sadly the photo was blurred. But you can make out Cadillac’s grin. It was just a lightly grilled hotdog. It wasn’t the best hot dog I ever ate; toppings were standard out of the bottle stuff. The one I had in Chicago right before we got in a taxi accident was better. 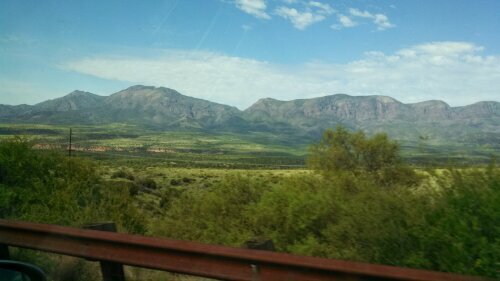 Tonto National Monument is about 3 hours SE of Flagstaff, close to a town called Payson, where we stayed the first night. 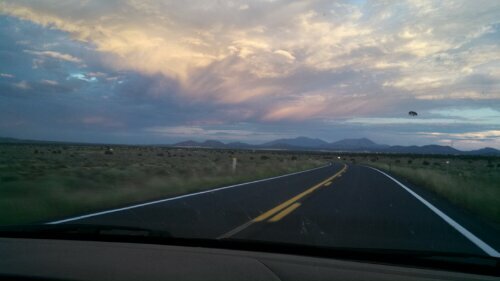 It is very scenic and not crowded at all. 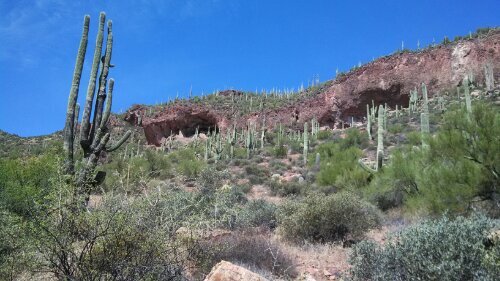 Lots of saguaro forests that turn into pine forests as the elevation changes. 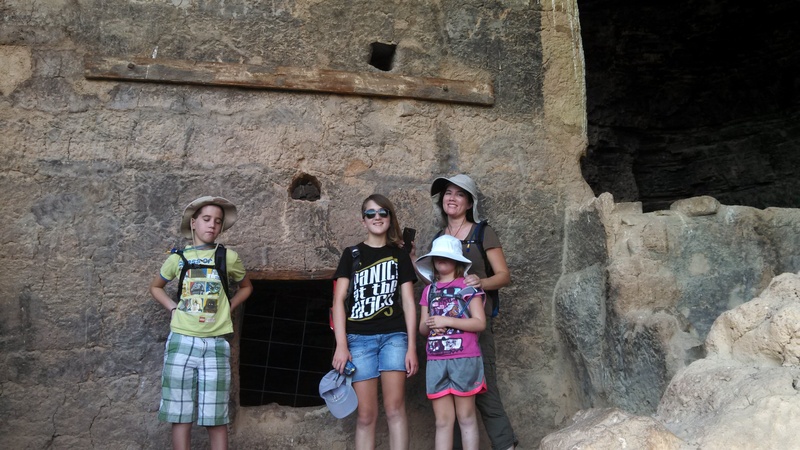 We got there first thing in the morning to do the hike up to the cliff dwellings, but it was already 107. 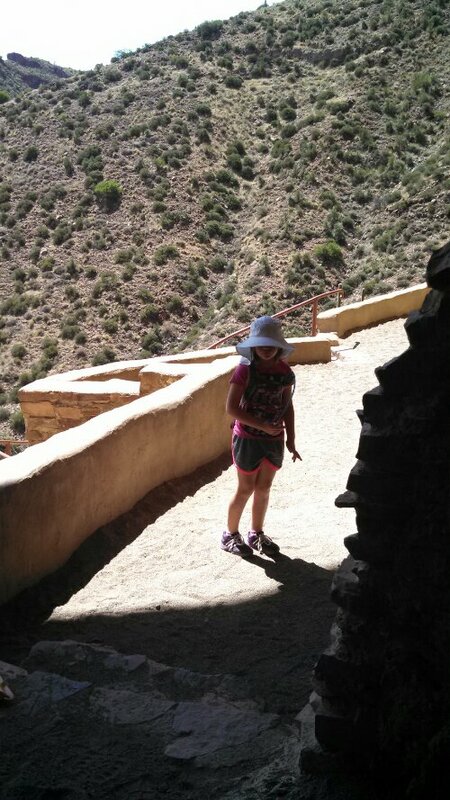 We had Camelbaks, sunscreen, and hats and walked slowly up the paved path, but Little Girl cried the whole way like somebody was jabbing in her the back with a spear. 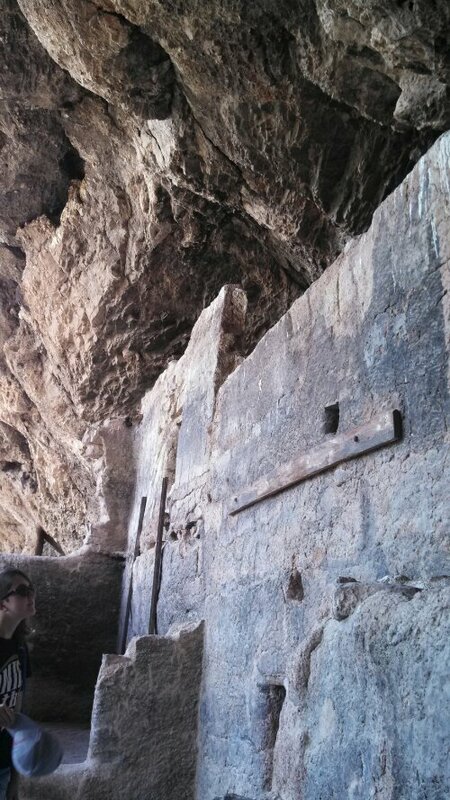 At the top was this pueblo which had many rooms and a fireplace. Little Girl was so mad at Cadillac that she pulled her hat down for all the pics. $3 per adult. Our A/C crapped out after this, for a good 40 minutes. That wasn’t so great. But it rebooted itself or something. 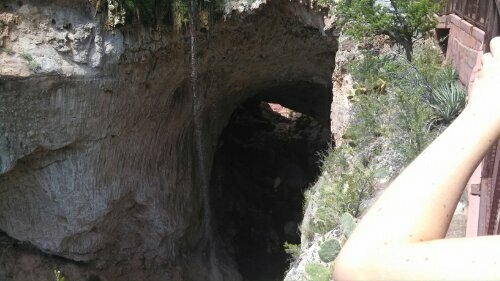 Then we made it to Tonto State Park Natural Bridge. This was a really nice park that had a lot of swimming spots and hiking trails. A thunderstorm was coming up behind us and we heard lightning. Now, on the car ride I was talking about how your hair stands up before lightning and how people don’t always know that. “We won’t get hit,” Cadillac promised. Well, I wasn’t too happy about being in the mountains during a thunder and lightning storm, so we quickly walked down to the viewing spot, took some pics, and went back to the car as it started to rain. We were there maybe 10-15 minutes. Cost: $25. But the next day we got to the Grand Canyon, and it looked like some 19th century painter had painted it, because I guess that’s what the landscape looked like! This was near dusk. 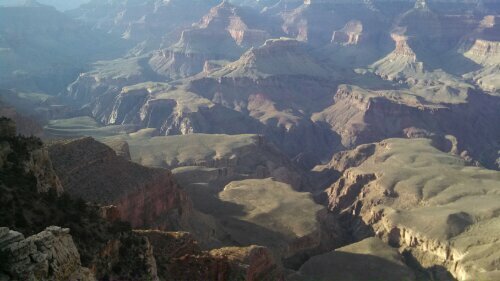 A great time to go (south rim is open 24/7) because people are clearing out, and it’s light until 7:30 in the summer, at least; so if you get there at like 4 you still have some time to walk around. We have no group photos of Boy with his eyes open. 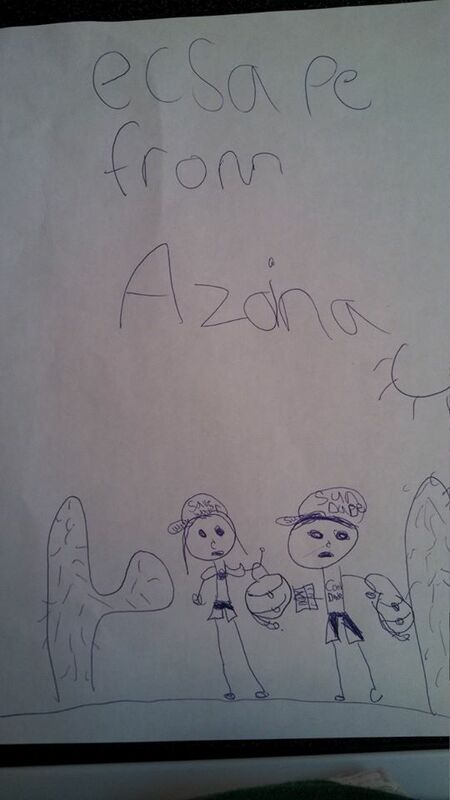 “I’ve got to draw this, so I don’t forget it!” Little Girl busts out her sketchbook to draw a scenic vista. “Have you seen that movie?” I asked. 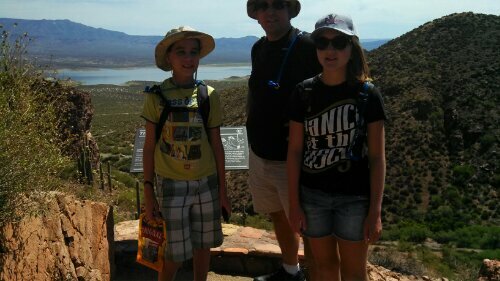 Me (to Eldest): How’d you like the Grand Canyon?